The preast has a cool head decoration. You used even a fan and golden epaulets for it. But I would prefer Achu's hat. Do you have that mini figure in your collection? The blood fountain is terrific! ...I would prefer Achu's hat. Do you have that mini figure in your collection? Staslegomaster, Thanks, I do have the Achu figure; the priest uses his cloak and legs (but you can't see them) and one of the guard's uses his face. I was thinking of using Achu's headdress but I though since I'd used two figures almost unchanged from the originals I thought I'd better try to mix it up a bit. 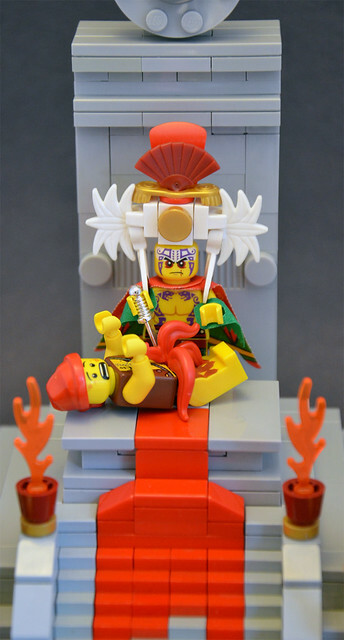 I really like the headdress,but the highlight of this MoC has to be the delightful blood flow! So gorey! Very true to the contest's intent! the build is very clean and expertly executed! Great work! Very nicely done! I was waiting for a sacrifice.. and here it is, gore and everything. You were right - your mix is more than cool! That headdress is fantastic--some brilliant parts usage with a wonderful result. I really like the blood on the steps, those two colours, grey and red, just work really well together, very pretty and bloody. Fab headdress too! This is a brilliant MOC. The set up is perfect and frankly speaking, I really like the hat of the main character. The angle you used for your photography is also perfect. Awesome creation! This has to be my favorite entry so far! Thanks everyone for your kind words, I've been wanting to build an aztec temple ever since the Aztec Warrior was released in 2012, and this competition has given me the motivation. I'm glad everyone likes the blood too; I don't usually like building violent scenes, this competition seemed to demand it, but I was concerned I'd gone overboard. This is a very neat design, dirtied only by the incredible volume of blood running down the staircase. I'm pretty sure that pirate is dead by now. 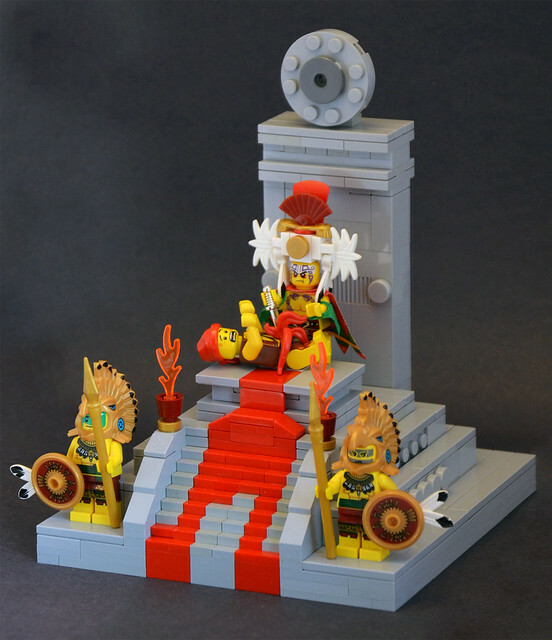 The headdress is perhaps the most imposing Lego headgear I've ever seen. Nice use of the Aztecs in a pirate build. Good work. To my mind this amazing creation is worth the 1st prize! Have you got any new plans ? Well. I surely wasn't expecting to see this when I came here! It's great though - the solid grey makes a wonderful background for the bright colors in the warriors, priest and spurting blood!